Cobblers goalkeeper David Cornell says fans should not read too much into his on-field ‘argument’ with team-mate Shay Facey during Saturday’s humbling defeat to Colchester United. Cornell and Facey were involved in a heated discussion in the aftermath of Colchester’s second goal, when Abobaker Eisa was left completely unmarked to fire through Cornell’s despairing dive. 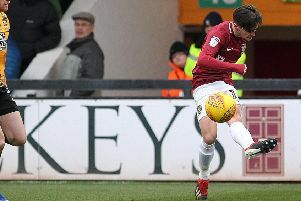 The Town stopper was just as frustrated after Kane Vincent-Young netted a third goal before things turned from bad to worse for the Cobblers when Sammie Szmodics bagged a fourth. But Cornell has dismissed any thought that there are tensions between players, saying it is purely ‘healthy’ debate and he would expect the same should he be at fault for a goal. “It’s not arguments,” he said. “If I believe someone should have done better to prevent a goal for instance, I’m going to tell them that. “If the goal’s my fault I expect the same and I expect someone to have a go at me. It’s healthy and we’re just trying to get the best from each other. Cornell cut a dispirited figure at full-time on Saturday after his side’s thumping defeat. He could not even take any pleasure from saving Harry Pell’s late spot-kick. He added: “I think we had some decent chances but you can’t concede four goals – what do you expect when you concede four goals? It doesn’t matter how many chances you get. “I can’t think about my contribution at all. I’m part of a team and we’ve been beaten 4-0 which obviously isn’t good enough from anyone. “It’s massively disappointing especially as we had a good run of form at home this season and for it to go like that was clearly disappointing.